D.C.’s non-English speakers have the right to interpretation or translation services when accessing services through the city, whether it’s requesting a housing inspector or getting food stamps. But a report released Thursday shows that many non-English speakers in the District experience major difficulties getting services in their native languages. The report [PDF] was released by the DC Language Access Coalition and American University’s Washington College of Law. (Disclosure: WAMU 88.5 is licensed to American University). DCLAC surveyed 258 people and found that Chinese and Vietnamese speakers had the most difficulty interacting with D.C. entities. Overall, 58 percent of people had some language access problem, such as not being able to get an interpreter or translated documents. 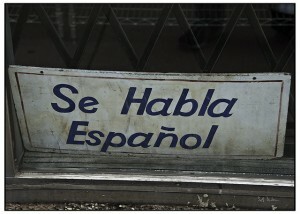 According to D.C.’s Language Access Act of 2004, D.C. agencies have to offer oral interpretation for all languages, and translate important documents into languages spoken by at least three percent of people needing services. The DCLAC report includes stories from Amharic speakers who had trouble getting food stamps for their children and Spanish speakers who couldn’t communicate with housing inspectors. Nearly 14 percent of D.C. residents are immigrants, most of whom hail from Latin America. As it stands, people who don’t get proper translation services can file complaints. But David Steib, a Legal Aid Society attorney who works with low-income clients, said his non-English speaking clients are often hesitant to file complaints for fear of retaliation by the agency they’re complaining against. The DCLAC report includes recommendations, including making sure D.C. employees who interact with the public are all trained in the Language Access Act and know what to do if a non-English speaker seeks services. They also recommend that agencies collaborate in training and outreach events. The D.C. Office of Human Rights is the city’s monitoring agency tasked with ensuring compliance with the Language Access Act. Director Gustavo Velasquez says his agency stands behind the DCLAC report, but adds that OHR conducts its own, yearly review which includes self-reports from the agencies and surveys from D.C. residents. Last year, OHR gave the D.C. government an overall ranking of “average” compliance. “[DCLAC's report] is very interesting. It tells us the story of people who have the perceptions and real experiences in dealing with the government,” Velazquez said. Those other recommendations include increased training and allowing people to sue the city for not complying with the act. Suing the DC Government because they can’t understand you asking for your foodstamps in Amharic is awesome.